Ramaphosa and Zuma appeared on several public panels during the week in what has been called a bromance. The former president will also be appointed to an Elders Council to advise Ramaphosa. But has the incumbent president lost face and lost ground in his identity as an anti-corruption leader by cosying up to Zuma? News reports on Sunday suggested that because President Cyril Ramaphosa was not booed in the week of election campaigning in KwaZulu-Natal, it is no longer a no-go zone for him as it has been since his election in February. This is interpreted as a victory. The power-punch province, which until recently had the highest number of ANC members, is now behind Ramaphosa, say party pundits. The governing party engineered a détente with former president Jacob Zuma, who ended the week campaigning for the party when there were previous fears that he was plotting a breakaway with a powerful faction in the party. The two appeared on several public panels during the week in what has been called a bromance. The former president will also be appointed to an Elders Council to advise Ramaphosa. But has the incumbent president lost face and lost ground in his identity as an anti-corruption leader by cosying up to Zuma? His messages this week appeared confused. 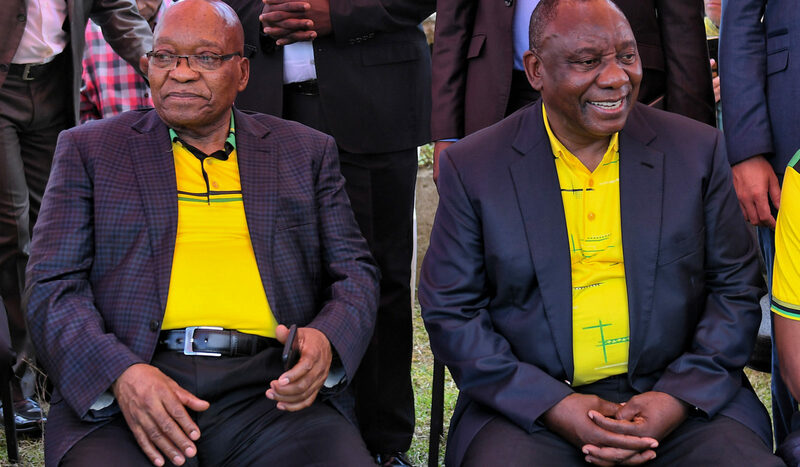 “We must acknowledge that State Capture and corruption have weakened several of our public institutions, undermined effective governance and contributed to the poor performance of our economy,” said Ramaphosa as Zuma looked on when the party launched its election manifesto on Saturday. Ramaphosa earlier in the week also said Zuma would be assigned “various tasks” even though the former president presided over the era that is under X-ray. The Zondo Commission of Inquiry into State Capture has placed Zuma at the centre of the unfolding narrative of patronage it has heard testimony of in the first three months of hearings. Zuma keeps a lawyer, Dan Mantsha, on retainer at the commission because he comes up so regularly in its hearings. Both former finance minister Nhlanhla Nene and Public Enterprises Minister Pravin Gordhan have blown the lid on how Zuma took personal charge of trying to push through the nuclear deal, the Petronas sale of Engen to PetroSA and of SAA’s procurement of planes, even though these were all over-priced and unaffordable. In addition, former deputy finance minister Mcebisi Jonas has sworn that Zuma’s patron family, the Guptas, had offered him the job of finance minister by using his son Duduzane Zuma as an interlocutor. On Sunday, as Ramaphosa was criticised by all leading analysts for his bromance with Zuma, City Press reported that the former head of state, again using Duduzane, had allegedly promised Czech organised crime leader Radovan Krejcir asylum for a bribe of R2.5-million. It was read by most commentators as a critique of Zuma’s decade-long administration; three months later, Zuma is set to be appointed to an Elders Council to advise the Presidency. With Zuma wielding influence and authority over Ramaphosa, it is unclear whether any attempt to prosecute the networks at the heart of State Capture can go ahead. And their alliance has arguably left the work of the Zondo commission without political protection and open to attack by powerful lobbies. On Saturday morning, as delegates lined up to get into buses to head to the Moses Mabhida stadium, a queue told a story. Former Mineral Resources minister Mosebenzi Zwane bounced up to get through the security machines and onto a bus. Zwane is at the centre of allegations that the government gifted the Guptas the soured Estina dairy farm deal; aided the family’s purchase of Optimum coal mines from Glencore to form their company Tegeta, and benefited from their largesse on a family trip to Dubai. In addition, his CV was shown to have been circulated to high political office by the Gupta family in the #GuptaLeaks emails. Tegeta is among the companies which so corrupted the coal supply at Eskom that the country’s economy is buckling under the weight of the electricity utility’s debt. In addition, the December 2018 power cuts were, in part, attributed to poor coal supplies. Closely behind Zwane in the queue followed Gordhan who is tackling the outcomes of State Capture at Eskom, Transnet and Denel. That both were delegates shows how the battle against State Capture is being waged within the ANC. By failing to put distance between himself and Zuma, Ramaphosa has strengthened the hand of the faction to which politicians like Zwane belong. The ANC makes election manifestos that resonate or respond to concerns raised in hundreds of constituency meetings. This time, corruption and jobs have come up as the two main issues making party members angry. The party always apologises for its missteps and promises to correct them. These are electoral psych-ops that work again and again. On the eve of the party’s manifesto launch, Ipsos released a poll showing the governing party has leapt to 61% in support, up from the perilous 50% it flirted at in 2016 when heightened reports of State Capture took the ANC’s popularity down to its worst levels reported by pollsters since the dawn of democracy in South Africa. “The ANC is emerging from a challenging period, where the values and principles of our organisation were eroded and undermined,” the party acknowledged in its annual January 8 statement which sets the political tone for the year. “We have also made progress in restoring the integrity and credibility of the ANC. Where necessary, we have taken measures to deal with cadres who have undermined the integrity of the movement and the ethical standards expected of public representatives and ANC leaders,” said the statement at the same time as the party itself engineered a fragile peace to keep Zuma in the ring of power. “… we remain resolute in our efforts to stamp out deviant and abhorrent practices,” the January 8 statement continued, at the same time as the party valourised Zuma, in an act of significant political cognitive dissonance. At the entrance to Durban, the ANC metropolitan government splashed millions of rand on statues erected in a temporary park. All weekend long, ANC members from around the country stopped at the park to shoot selfies with the sculptures of former and current leaders. At the centre of the display, on a plinth, and sculpted in copper, were statues of Zuma and Ramaphosa shoulder to shoulder, fists in the air in the ANC’s sign of power and hope. The bromance, orchestrated and planned, was now cast in bronze.